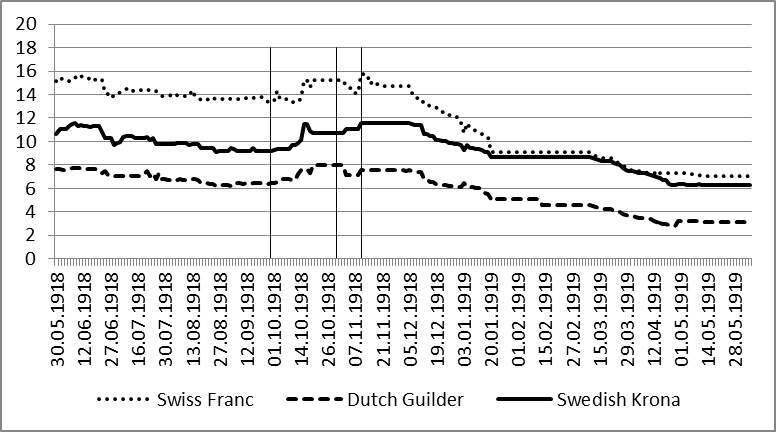 Did events during the First World War reflect in the foreign exchange rates? A new EHES working paper by Avni Önder Hanedar, Hatice Gaye Gencer, Sercan Demiralay, and İsmail Altay from different universities in Turkey provide evidence on the foreign exchange trading at the Istanbul bourse of the Ottoman Empire to shed light on this question. They examine the influence of political risks on the foreign exchange rates at the Istanbul bourse during the First World War. Their empirical methodology is identifying the abrupt changes in the value of Lira against the currencies of the neutral countries at the Istanbul bourse, i.e., the Dutch Guilder, the Swedish Krona and the Swiss Franc. 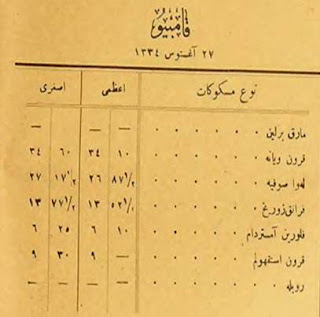 They exploit unique data on daily foreign exchange rates announced at the Istanbul bourse from May 1918 to June 1919. 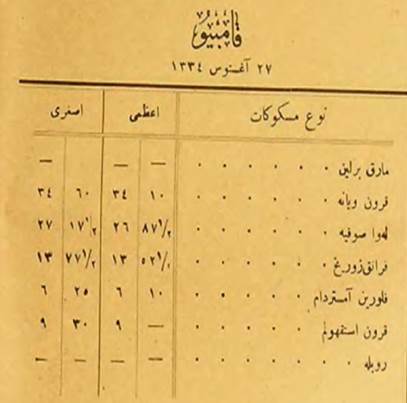 The data are manually collected from the Ottoman Empire’s official newspaper, i.e., Takvim-i Vekayi. A column of Takvim-i Vekayi showing the value of Turkish Lira against several foreign currencies on 27 August 1918 (Takvim-i Vekayi. (28 August 1918). Kambiyo: 6. They fill the gap in the historical literature on the Ottoman economy for the period ended by the First World War, in which there is a lack of empirical research (See Hanedar, Hanedar, & Torun (2017, 2016)). Furthermore, the literature on the impacts of the First World War on foreign exchange rates is confined (See Hall (2004), Kanago & McCormick (2013)). The findings pinpoint the sudden changes in the value of Lira against the currencies of the neutral countries at the Istanbul bourse during important war-related events pointing out that the end of WWI was approaching. The war and occupation of the Allies deteriorated the economy of the Ottoman Empire, whereby the inflation levels surmounted along with the huge budget deficits. These circumstances were reflected in the foreign exchange rates and the Lira devaluated significantly against the currencies of the neutral countries by the end of the war. The research uncovers the effect of the war-related events on the foreign exchange rates using data from the First World War and validates the significance of these events at the beginning of the 20th century. It can be suggested that even at the war conditions, the Ottoman foreign exchange market displayed efficiency to some degree in the period marking the end of WWI. This blog post was written by Avni Önder Hanedar, researcher in economics and econometrics at (Dokuz Eylül University and Sakarya University). Hall, G. J. (2004). 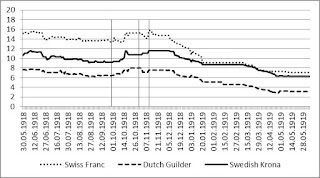 Exchange rates and casualties during the First World War. Journal of Monetary Economics, 51(8): 1711–1742. Hanedar, A. Ö., Hanedar, E. Y., and Torun, E. (2016). The end of the Ottoman Empire as reflected in the İstanbul bourse. Historical Methods, 49(3):145–156. Hanedar, A. Ö., Hanedar, E. Y., Torun, E., and Ertuğrul, M. (2017). Perceptions on the Dissolution of an Empire: Insight from the İstanbul Bourse and the Ottoman War Bond. Defence and Peace Economics, (Forthcoming). Kanago, B. and McCormick, K. (2013). The Dollar-Pound exchange rate during the first nine months of World War II. Atl. Econ Journal, 41(4): 385–404. Takvim-i Vekayi. 30 May 1918–11 June 1919. 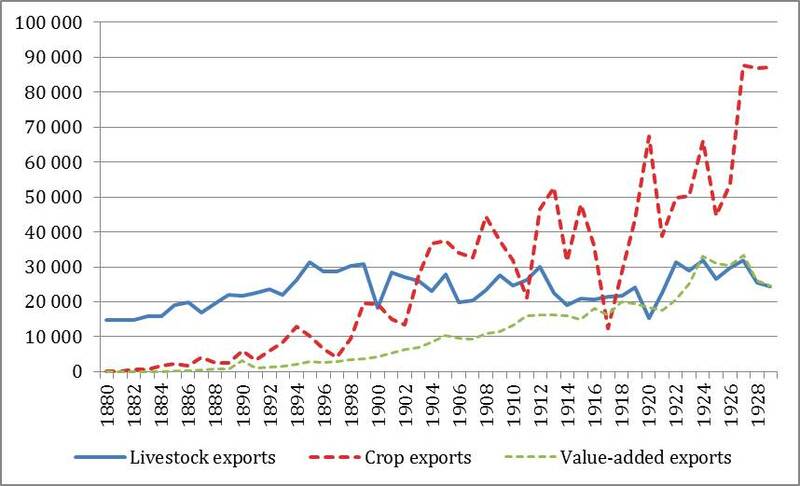 Why did Argentina become a super-exporter of agricultural and food products during the Belle Époque (1880-1929)? In the first wave of globalization the populations of some extra-European countries were also able to earn high incomes but with low levels of industrialisation. These countries had been recently colonised by Europe (Canada, Argentina, Uruguay, Australia and New Zealand), and their economic growth was based on the rapid expansion of their exports of primary products and on the linkage effects of these exports with other economic activities. This was the case of Argentina during these years. 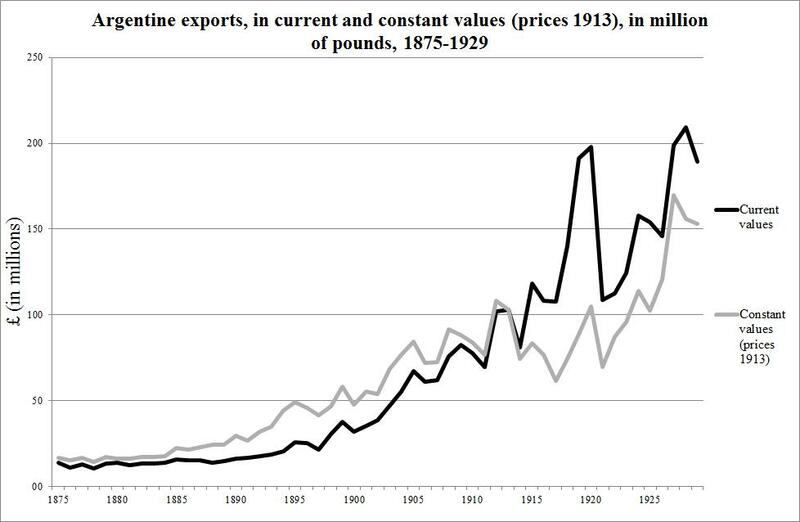 According to the recent estimates of world trade published by Federico and Tena-Junguito (2016), Argentine exports, which represented around 0.8% of world trade during the early 1850s, reached levels of almost 4% in the 1920s . There are very few studies that use a cliometric perspective in order to identify the determinants of such an accelerated growth in exports, which is a necessary condition for the export-led model to work. The objective of this work is to provide a cliometric contribution to this field of study, constructing a gravity model to explain the determinants of the growth of Argentina’s exports between 1880 and 1929. To this end, the bilateral export data we need have been drawn from a meticulous review of the Argentine foreign trade statistics. In contrast with the vast majority of the quantitative analyses of this subject, we have studied the annual path of the principal export products; that is, the destinations of each individual product. 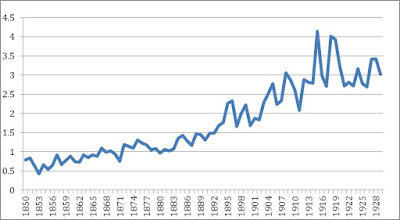 The following chart summarises Argentine exports in current and constant values (calculated with the prices of 1913) (Figure 2). Source: Own elaboration according to official Argentine statistics (1875-1929) and Cortes Conde et al. (1965). As we can see, Argentina’s integration into international markets was successful after the 1870s. But, according to Cortes Conde (1985), it was not until the last decade of the nineteenth century that exports contributed to paying for debt services and to financing imports, which was necessary not only to transform the productive structure but also to cover the consumption needs of the domestic market. To analyse export growth, we have separated the products into three groups: 1) traditional livestock exports, which include wool, salted and dried cattle hides, raw sheep skins, bovines, jerked meat and tallow; 2) crop exports, that consider wheat, corn and linseed and 3) processed agrifood exports, which are composed of chilled and frozen beef, frozen mutton, wheat flour, quebracho logs and quebracho extract. As we can see first, although the first group also grew, if we ignore the fluctuations and focus on a long-term perspective, the second and the third groups grew more and at a faster pace. Figure 3. Breakdown of Argentine exports at constant prices of 1913 (thousands of pounds). Own elaboration. Source: Argentine official statistics. Our econometric results reveal that the increase in Argentina’s GDP was important to explain the export growth. On the one hand, new lands were successfully incorporated into the productive system. On the other hand, labour and capital, traditionally scarce factors, were supplied from abroad. However, obviously without a solvent demand for the type of goods in which the country successively specialised, the export business would not have developed sufficiently. Therefore, the demand for food and raw materials, particularly from the most developed European countries, was essential. The fall in transport costs was also a contributing factor. However, during the period analysed, the increases or reductions in tariffs did not have a significant effect on the country’s exports as a whole. These overall results are better understood when analysed by types of product. This also constitutes an original contribution since the literature has generally not differentiated between different export goods. In this case, significant peculiarities may be observed. 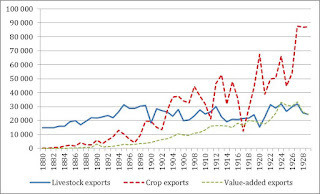 The development of the Argentine economy constituted an obstacle for the growth of its exports of livestock products (unprocessed), as agriculture competed for the land on which this activity was developed. Furthermore, the emergence of a meat-processing industry gave rise to a preference for the export of frozen and chilled meats as opposed to live animals. The opposite was the case for raw and processed agricultural and livestock products that experienced an improvement in exports as a result of the country’s economic growth. Tariff protection only had a significant effect on agricultural products, particularly wheat, which, from the end of the nineteenth century, faced increasing obstacles in some continental countries. 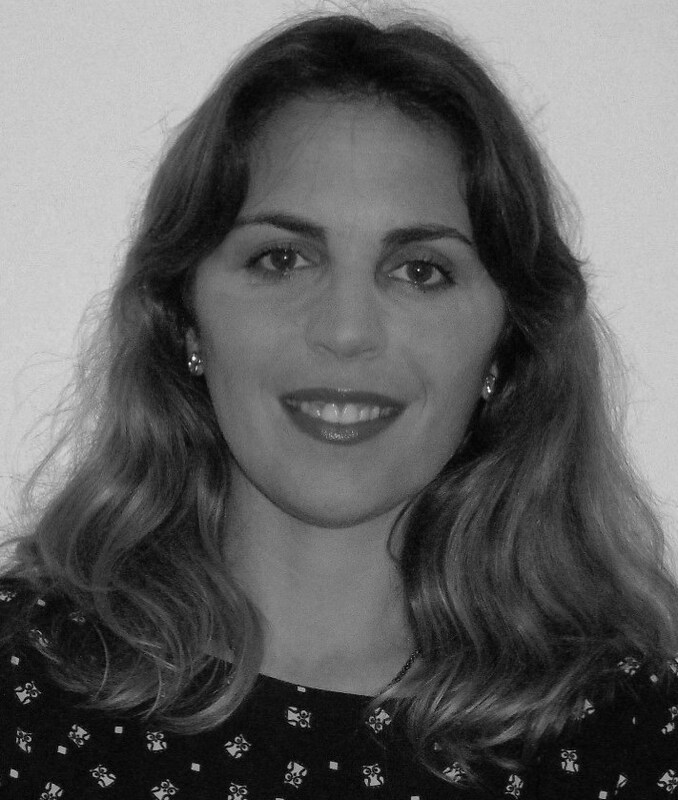 The blog post was written by Vicente Pinilla (Universidad de Zaragoza) and Agustina Rayes (Universidad Nacional del Centro de la Provincia de Buenos Aires). 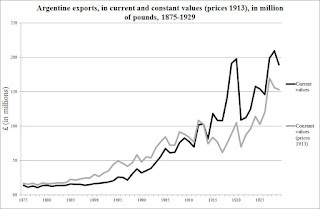 Cortés Conde, R. (1985): “The Export Economy of Argentina, 1880-1920”, in R. Cortés Conde and S.J.Hunt (eds. ), The Latin American economies: growth and the export sector 1880-1930, Nueva York, Holmes. Federico, G. and Tena-Junguito, A. 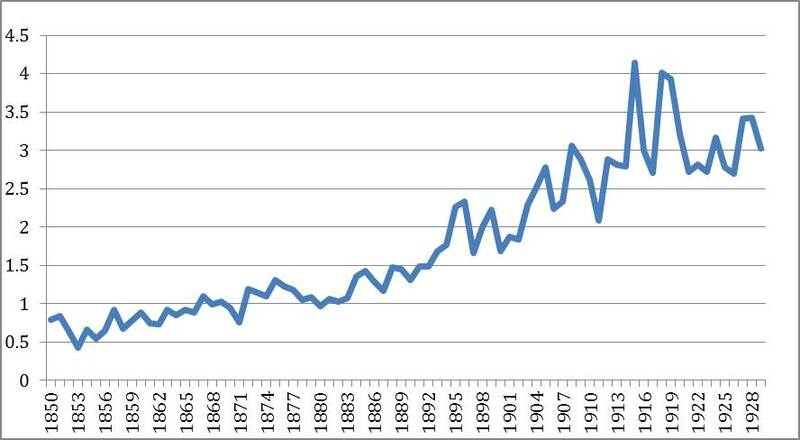 (2016): “World trade, 1800-1938: a new data-set”, European Historical Economics Society, Working Paper 93. After many years of relative neglect, plague has recently started to recover a long-lost popularity among economic historians. In particular, the Black Death pandemic of the fourteenth century has been singled out as a possible factor favouring Europe over the main Asian economies, particularly India and China (for example, Clark 2007; Voigtländer and Voth 2013). Indeed, there is evidence of a long-lasting improvement in European and Mediterranean real wages immediately after the Black Death (Pamuk 2007; Campbell 2010). However, there is also evidence that in less densely populated areas of Europe, like Ireland or Spain, the long-term consequences of plague were negative, not positive, as “[Plague] destroyed the equilibrium between scarce population and abundant resources” (Álvarez Nogal and Prados de la Escosura 2013, p. 3). More generally it can be argued that maybe, among plagues and other lethal epidemics, the Black Death is the exception in having had (mostly) positive long-run consequences (Alfani and Murphy 2017). Indeed, in a recent article I suggested that during the seventeenth century, the epidemiology of plague differed between the North and the South of Europe (Alfani 2013a). The South, and Italy in particular, was affected much more severely than the North. In 1629-31, plague killed about one-third of the population of northern Italy. A second epidemic, in 1656-57, ravaged central-southern Italy. In the Kingdom of Naples, overall population losses are in the 30-43 per cent range (Fusco 2009). The economic consequences of these plagues were negative and indeed, I argued that the differential impact of plague contributes to explain the origin of the relative decline of the most advanced areas of Italy compared to northern Europe (Alfani 2010; 2013a; 2013b). In a new EHES working paper which I co-authored with Marco Percoco, we introduce the largest-existing database of urban mortality rates in plague years. This allows us, first, to demonstrate the particularly high severity of the last Italian plagues (in the two seventeenth-century waves, mean mortality rates in cities were in the order of 400 per thousand), and secondly, to analyze their economic impact. By using the methods of economic geography, we study the ability of a mortality crisis to alter the growth path followed by a city (in particular, we follow the approach introduced by Davis and Weinstein 2002). 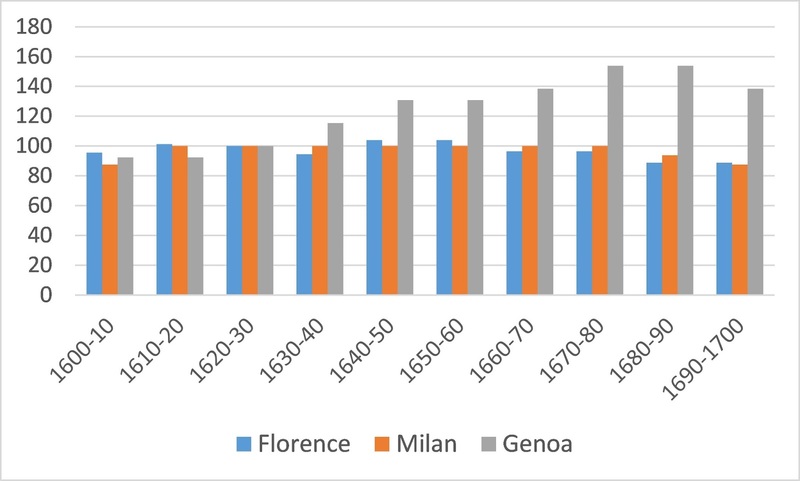 We find evidence that the 1629-30 plague affecting northern Italy was able to displace some of the most dynamic and economically advanced Italian cities, like Milan or Venice, moving them to a lower growth path. We also estimate the huge losses the epidemic caused in urban populations (Figure 1), and show that it had a lasting effect on urbanization rates throughout the affected areas (note that changes on urbanization rates and in city size are often used as an indicator of economic growth or decline over the long run: see for example Bosker et al. 2008; Percoco 2013). Our argument is further strengthened by the fact that while there is clear evidence of the negative consequences of the 1630 plague, there is very little to argue for a positive effect. As we suggest, the potential positive consequences of the plague were entirely eroded by a negative productivity shock. Our regression analysis provides indirect evidence of this, however there is also direct evidence as for key cities like Florence, Genoa and Milan we have time-series of real wages of masons covering the entire seventeenth century (Figure 2). 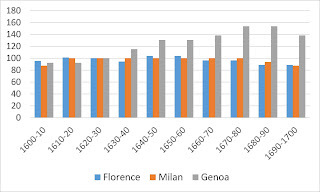 This sample of cities includes one heavily affected by the 1630 plague (Milan: mortality rate of 462 per thousand), one relatively less affected (Florence: 137 per thousand) and one entirely spared (Genoa). Interestingly, of the three, the only one showing signs of an increase in real wages after 1630 is Genoa. Figure 2. 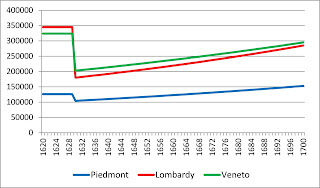 Real wages of masons in cities of northern Italy and overall urban and rural real wages in central-northern Italy, 1600-1700 (index based on the average of 1620-30). By demonstrating that the plague had a permanent negative effect on many key Italian urban economies, we provide support to the hypothesis that the origins of the relative economic decline of the northern part of the Peninsula are to be found in particularly unfavorable epidemiological conditions. 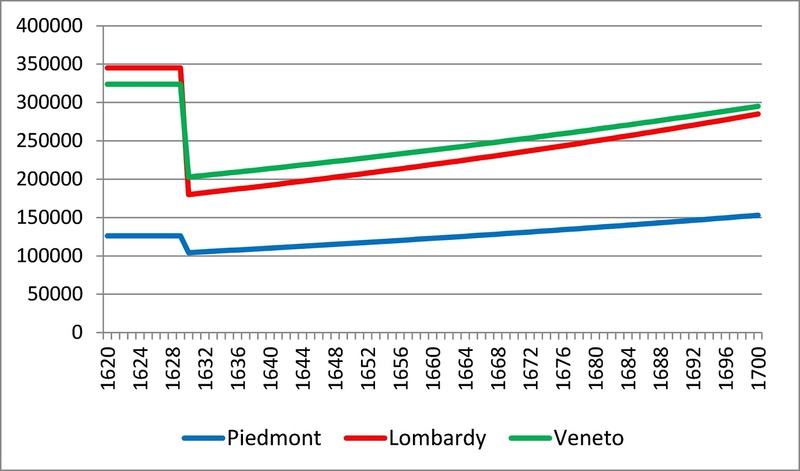 More generally, our paper provides a useful new perspective on Italian long-term economic trends, including aspects like the falling-back of northern Italy compared to its main European competitors and the final consequences of the progressive “ruralization” of the Italian economies during the seventeenth century. 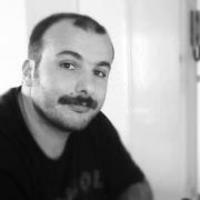 Alfani, G. 2010. ‘Pestilenze e «crisi di sistema» in Italia tra XVI e XVII secolo. Perturbazioni di breve periodo o cause di declino economico?’, in S. Cavaciocchi (ed. ), Le interazioni fra economia e ambiente biologico. Florence: Florence University Press: 223-247. Alfani, G. 2013b. Calamities and the Economy in Renaissance Italy. The Grand Tour of the Horsemen of the Apocalypse. Basingstoke: Palgrave. Alfani, G. and T. Murphy. 2017. ‘Plague and Lethal Epidemics in the Pre-Industrial World’, Journal of Economic History, 77(1): 314-343. Álvarez Nogal, C. and L. Prados de la Escosura. (2013). ‘The Rise and Fall of Spain (1270-1850)’, Economic History Review, 66(1): 1–37. Bosker, M., Brakman, S., H. Garretsen, H. de Jong, and M. Schramm. 2008, ‘Ports, Plagues and Politics: Explaining Italian City Growth 1300-1861’, European Review of Economic History, 12: 97-131. Campbell, B. M. S. 2010. “Nature as historical protagonist: environment and society in pre-industrial England”, Economic History Review 63: 281-314. Clark, G. 2007. A Farewell to the Alms: A Brief Economic History of the World. Princeton: Princeton University Press. Davis, D.R. and D.E. Weinstein. 2002. ‘Bones, Bombs, and Break Points: The Geography of Economic Activity’, American Economic Review, 92(5): 1269-1289. Fusco, I. 2009. ‘La peste del 1656-58 nel Regno di Napoli: diffusione e mortalità’, in G. Alfani, G. Dalla Zuanna and A. Rosina (eds. ), La popolazione all’alba dell’era moderna, special number of Popolazione e Storia, 2/2009: 115-138. Malanima, P. 2013. ‘When did England overtake Italy? 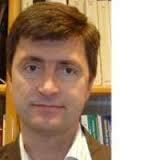 Medieval and early modern divergence in prices and wages’, European Review of Economic History, 17: 45-70. Pamuk, S. 2007. ‘The Black Death and the origins of the ‘Great Divergence’ across Europe, 1300-1600’, European Review of Economic History, 11: 289-317. Percoco, M. 2013a. ‘Geography, Institutions and Urban Development: Evidence from Italian Cities’, Annals of Regional Science, 50: 135–152. Voigtländer, N. and H.J. Voth 2013. “The Three Horsemen of Riches: Plague, War, and Urbanization in Early Modern Europe.” Review of Economic Studies 80 (2): 774–811.